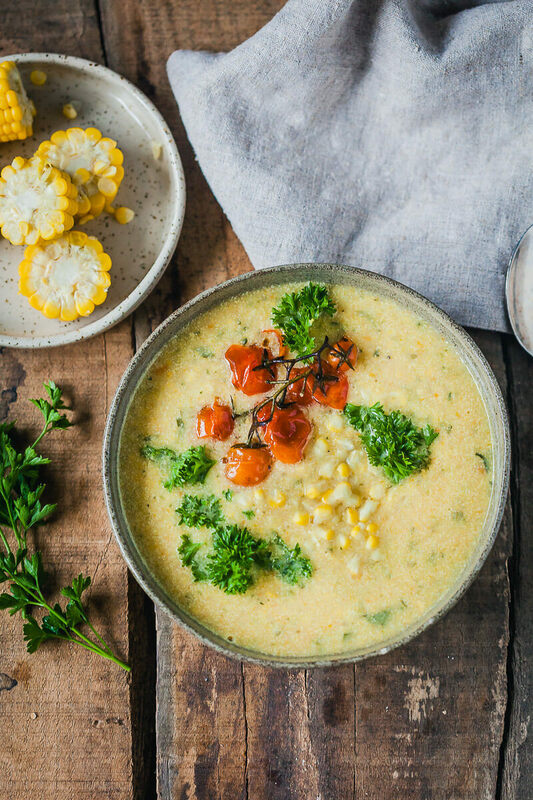 This Zucchini Corn Chowder is packed full of veggies and fiber, it is creamy, delicious and filling. And it's vegan and gluten-free! Prep your veggies. Peel and slice onion, garlic, carrot. Peel and dice potatoes. Slice or dice zucchini. Shave earn of corn with a knife to release kernels. Place a pot to stove and heat on medium. Add a spoon of olive oil and add onions. Fry until translucent, giving it a quick stir occasionally. Then, add garlic and carrots. Cook for a minute or two, then also add potatoes, corn kernels and bay leaf. Pour in about 2 cups of vegetable stock, lightly season with salt and pepper and let cook for about 10-15 minutes, until the vegetables soften. Then, add diced zucchini and the rest of the vegetable stock and season some more. Cook for another 10 minutes, until the vegetables are soft. When the vegetables are cooked, remove pot from stove, remove the bay leaf and take out about 2/3 of the soup into a separate container. Blend into a semi-smooth soup with a stick blender, then return to pot and combine with the non-blended ingredients. Add vegan cooking cream and chopped parsley and combine well, bringing to a boil. As soon as it begins to boil, remove from stove and taste if it needs any more seasoning. OPTIONAL: decorate your soup with roasted cherry tomatoes: Get a bunch of cherry tomatoes and place on a baking tin, lined with aluminium foil. Drizzle with olive oil, season with salt and pepper and add a pinch of sugar. Place in a preheated oven and roast for about 15 minutes on 200 °C / 390 °F, until the tomatoes soften and turn golden-brown. Remove from oven and place into the chowder.